On June 1, I hosted my neighborhood’s Book Club meeting. The book we chose to read and discuss? My latest suspense novel, DADDY’S GIRL. We talked about my other books, too, including my creative nonfiction book ALL THE ABOVE: MY SON’S BATTLE WITH BRAIN CANCER. Many of my neighbors had known Jack since he was a little boy (he was 9 when we moved in), and they were touched by his story. Book club members holding my novels UNDERWATER and DADDY’S GIRL, nonfiction ALL THE ABOVE, and of course…wine. I was thrilled to see everyone that night. Although these are the only photos we took, there were about 18 people at the meeting. I’ve been hit or miss lately at our meetings, but I’m always interested in what we select to read. I like to read multiple genres, and luckily, the book club does, too. We talked about my novel, and members were also very interested in my writing process, my path to publication, and what it’s like to work with an editor. Just the kinds of things I like to talk about! We drank wine, munched on appetizers, and enjoyed catching up when we weren’t talking books. I’d love to be a guest at YOUR book club anytime, in person or via Skype. Just let me know when! Two nights later, I attended the 53rd Annual Georgia Author of the Year Awards banquet. DADDY’S GIRL was a Nominee in the Mystery/Detective category (the best fit, since there isn’t a Thriller/Suspense category, too). There were over a dozen Nominees in the category, and though it didn’t win, I was thrilled to be there and to be nominated. It was wonderful to be among writers of many genres and watch as a Winner and a Finalist were chosen in each group. What else is planned for June? Basically, writing (book 5). So far, it’s unnamed, but the characters are in serious development, and the scenes are coming together. Stay tuned. Find my books at Barnes & Noble! The “Perimeter” Barnes & Noble on Perimeter Center West in Atlanta (near Perimeter Mall) now stocks signed copies of three of my books! Deciding what to read…and a flashback! Start to finish, it takes (me) about two forevers to write a book. Then, when it’s finished, it gets dropped into the ocean of everything that’s available for people to read: books (in tons of genres, fiction and nonfiction); news articles/newsfeed; essays and opinion pieces; blog posts; social media updates on Facebook, Twitter, etc. ; and even short stories, flash fiction and poems. And that’s not all. There’s also entertainment like films, TV, videos, and plays–yes, plays– that pull us away from the printed written word on a page or device. So when I finish writing a book (make that, birthing my baby, because when you’re writing a book, it feels like you’re having a baby), I know it’s competing with a gazillion other things out there, to catch your eye and your attention. So – how do I get you (y’all, and more important, all of y’all) to give my book a chance, for your time? How do I get it in front of you, even as one of your options? It’s hard, Mesdames et Messieurs. It’s quite hard. Flashback to the 90s, when I had little kids at home, and very little time to read. But I did read. I read in the carpool line, and before I went to sleep. I read at the park. I didn’t have a device or even a laptop, and I spent little time at the desktop computer we owned. I watched movies and some TV, but I liked to read. A lot. How did I find books to read back then? Good books, that is – books that I was going to enjoy and remember? I had little time to myself, and even less to spend in those big fancy bookstores that were coming into vogue. I remember one time I got a generous gift card to spend at one of them, and I had a little time to browse while one kid was at a piano lesson, another was at dance, and the other two were at soccer. I walked into the fiction section and began to walk down the aisles. I wanted to make some good choices; I was BUYING some books for me, and I didn’t want to regret my purchases. But I wasn’t in a book club, nor had I heard what the new must-have novels were. I was suspicious of anything positioned at the front of the store; maybe there was something for me there, but maybe not. I didn’t have time to watch Oprah, so I didn’t know what she was pushing. All I had read recently were classics that we already owned, that I either hadn’t read, or had read (but didn’t remember), or that my oldest kids were reading in school. But I didn’t want to buy a classic that day. I wanted something new and something great. I wanted to discover something. The clock ticked by and I made my selections. I don’t know if I wandered back to the front and picked up a best seller, or took a chance on a book whose cover I liked. Maybe I bought something written by someone whose other books I had already read and liked, such as Peter Mayle, Maeve Binchy, Ferrol Sams, David Sedaris, or Nicholas Sparks. Back then (and now) I read (and read) lots of different genres. It was great to find something new I liked, and tell people I knew about it. And now that I’m an author, that’s just what I want readers of my books to do (if they like my books, that is): tell others about them. Even though what I like may not be what you like (or even, what I write may not be what you like), talking about books seems fun to me. I may give what you recommend a chance, and love it. But even if I don’t love it, I’ve tried it. I’ve sampled something new. I’ve given something a chance for my attention (and my brain) that somebody, somewhere sat down to write. And it may have taken them a couple of forevers to finish it. I’ve tried my best to get the books I’ve written in front of potential readers. I’ve set up and appeared at book signings. I’ve participated in book festivals and served on panels. I’ve sent out emails, newsletters, and updates to my friends on Facebook, and followers on Twitter and Instagram. I’ve offered my books as free downloads and giveaways, produced book trailers, and thrown parties. 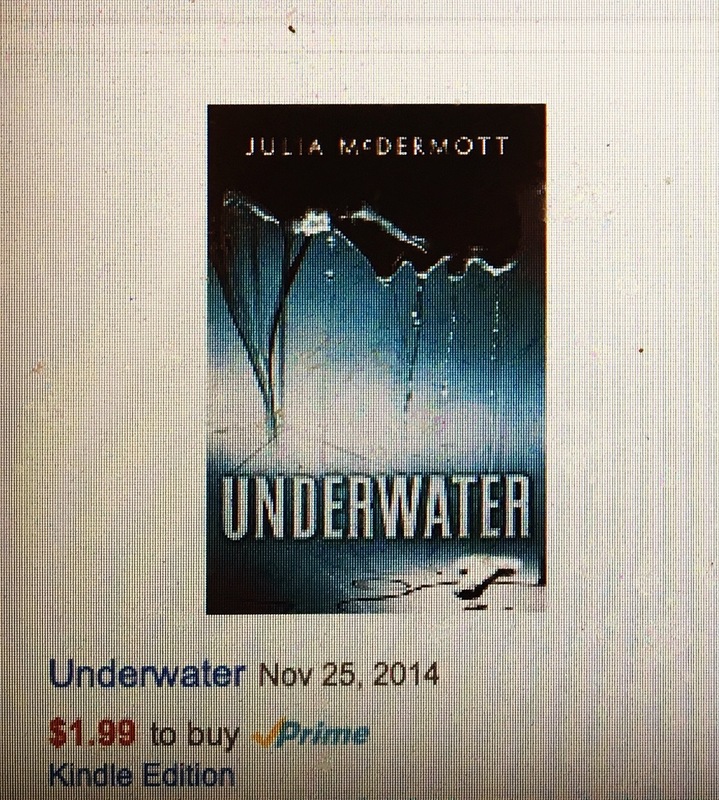 The publisher of my suspense novel UNDERWATER has done a great job promoting it and has included it in various promotions and Kindle deals. And I’ve asked readers to write and post reviews of my books on Amazon and Goodreads. I hope that if you discover my books, you enjoy reading them. In different genres, two are written in first person, and one in third, with multiple points of view. Two are novels (fiction) and one is a true story (memoir). My fourth book, another suspense novel, will be published very soon. Lately, I’ve begun writing my fifth book, a novel. My characters are clear in my head (and on paper), and so are some of their conflicts. But I’m still struggling with some pieces of the plot. If you’ve read this far, you like reading; you might even love it. If you don’t love my books, or my writing, then I hope you find something in them to like–no matter how different they might be from what you expect, or usually read, like, love, or see at the front of the bookstore, in Costco, in People magazine, or on Oprah (is she still doing that?). With each book, there was a day that I got up in the morning, sat down in front of a blank computer screen, and tapped the first letter. And, IF you read one of my stories and like it, I hope you will take the time to write a review of it on Amazon. Don’t worry about exactly what to say. I promise it won’t take much time to do. I recently wrote a review of a book I had read, and it took me about five minutes. Because what gets a book to buoy up to the surface of the reading (and entertainment) ocean–and stay there, for a while–is the number of reviews it has (and not what they say, exactly). The more reviews, the more people who find the book somehow start to think, “Hmm. That might be interesting, because so many other people thought it was.” They also know that many more people (than the number of reviewers) bought the book as well, but didn’t review it. S’il vous plaît…Just do it. Because I did.